Competency: We stay abreast of the latest developments in prosthodontics and general dentistry to provide quality, consistent treatment that exceeds patient expectations. Responsibility: We use the highest-quality dental laboratories, materials, and tools to ensure patient comfort and safety. Evidence-Based Dentistry: Rather than taking a one-size-fits-all approach, we base our treatment decisions on current research and scientific evidence, combined with the patient's unique health needs, to create an individualized plan of action for attaining optimal oral health. Dr. Lee's approach to treating patients includes state-of-the-art diagnostic tools such as digital X-rays and intraoral cameras to detect oral health problems in the earliest stages possible. Once he establishes a diagnosis, he will take into account your medical history and individual needs before making treatment recommendations. Using a monitor in the exam room, he will show you digital images of your mouth to explain your diagnosis. After answering your questions and assessing your needs for comfort and sedation, he will present you with a written treatment plan that includes the scheduling and fees for the procedure. At Evergreen Dental, we strive to provide a comprehensive menu of dental services to meet all patient needs under one roof. From checkups and cleanings to root canal treatments, Dr. Lee's services cover all of your general dentistry needs. Having earned a specialized dental certification in prosthodontics, Dr. Lee can restore your ability to chew and speak optimally if you have lost teeth, suffered facial trauma, or have congenital abnormalities. His dental expertise also extends to cosmetic services, from teeth whitening to veneers. Staying on the cutting edge of dentistry requires commitment to continuing education, as well as the desire to perform research and share the results through teaching and publishing in professional journals. 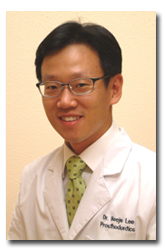 The knowledge he has acquired through his academic endeavors allows Dr. Lee to provide the most up-to-date techniques and equipment to his patients. Keeping patients comfortable with safe sedation methods and modern dental tools is our top priority at Evergreen Dental.